It was in 1961 when the Smoker family launched their first boat and over 50 years later the Smoker family is still building their Smoker Craft aluminum fishing boats handmade in New Paris, Indiana. 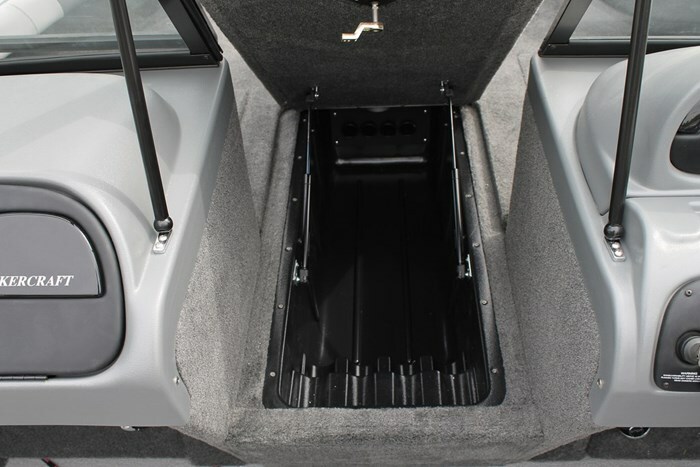 While not the the biggest Millentia, the 172 is a pro style compact V bottom boat that will be home in the garage ready for a weekend of family fishing fun or a serious fishing tournament with the best of the best. With a length of 17 feet 2 inches, you can first see where the 172 gets it name, but you’ll also realize that it will fit nicely in your garage, swing away tongue or not. It’s a boat that seems to change shape because when you stand next to it at the dock it’s hard to believe it is only a hair over 17 feet. That’s because it makes use of every inch of the 91 inch beam. The transom width is 88 inches which tells me that it has a big footprint, making it stable at rest. But what is really to thank for that is the exclusive Hydra Lift Hull and its reverse chine design. Five keels along the bottom as well as spray rails that are rolled into the side panels give you a boat that jumps on plane, tracks straight at all speeds and keeps water down and away for one of the driest rides in the industry. Tested with the band new Yamaha VF115 VMAX SHO I recorded stellar performance numbers. The all new lightweight four stroke to plane in under 3 seconds and to 20 mph in 3.8 seconds. While settling into a comfortable cruise of 29 mph at 4000 rpm I noticed how not only smooth the ride was but how quiet it was too. During construction, Smoker Craft first installs the flooring then injects foam that helps with buoyancy but also absorbs noise. Their competitors tend to spray the foam in then cut it down to install the flooring. That can lead to uneven spots and the chance for water to pool up, never a good thing. While we didn’t experience much in the way of rough water, when I crossed back over my own waves from turning around the spray rails deflected the water down and away. 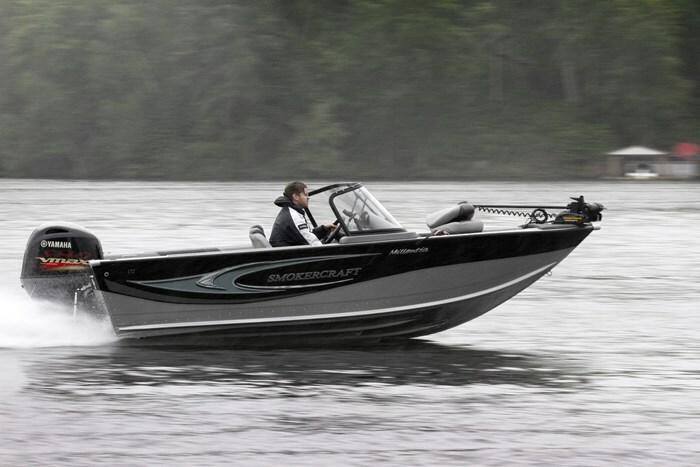 Should you happen to run into rough water conditions you will be thankful hearing about the Advance Integrated Rib System or AIRS which are hat shaped ribs that conform around the bow of the boat and overlap the stringers strengthening the critical area of the running surface. Competitors like to use double plating but if you want a comparison think about it like cardboard and paper. You can stack many sheets of paper on another which yes will make it stronger than a single piece but when compared to cardboard not nearly as strong. Smoker is cardboard and competitors are paper. When looking at the fishing features, you will find locking rod storage not only in the bow between the consoles but in the gunnels as well. Multi species anglers are going to love this as they don’t have to limit how many rods they bring. The gunnels are wides enough as well to add downrigger mounts or Bert’s Custom Tackle track pads for multiple accessory options. 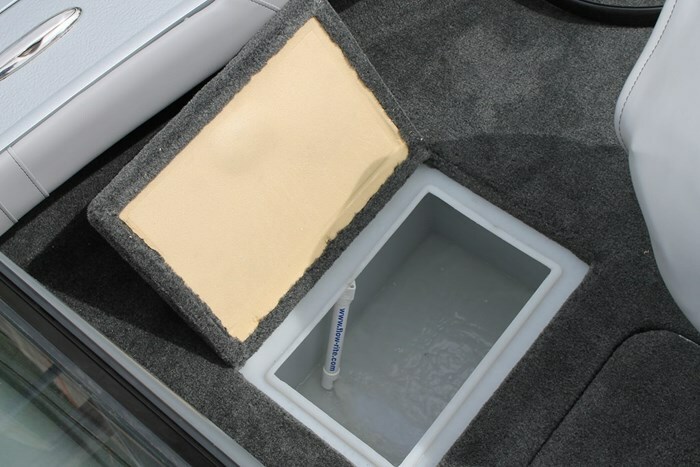 There is a 15-gallon livewell in the bow and a 21-gallon livewell in the stern. Three fishing chairs are standard. If you wish to add more seating you can either get another seat or go for the optional fold down stern jumper seats. 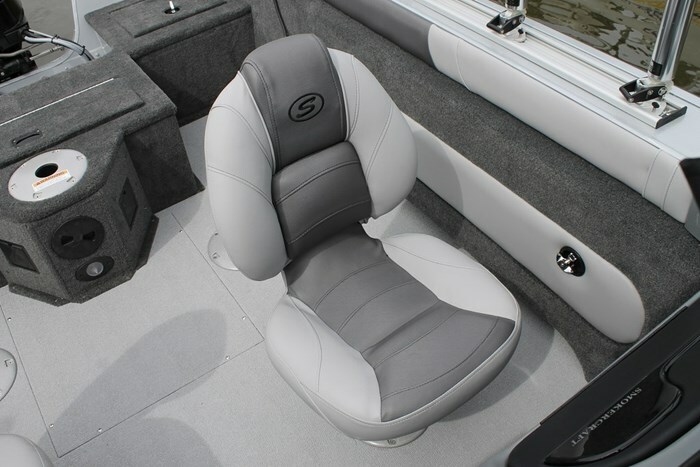 I would spend the extra money and go with that option simply because it also increases the size of your rear casting deck. Touching back on performance I must say I was sincerely impressed with how well the new Yamaha 115 VMAX performed when paired up with the 172. I already mentioned how fast it jumped to plane, but then keep going and I hit a top speed of 46 mph at the rev limit of 6000 rpm. The boat was lightly loaded with just myself on board. Put two more guys in it, a full tank of gas, batteries and fishing gear and I estimate you would lose about 6 mph but even still that makes for a great performing package. Finally it’s worth noting that when you purchase a Smoker Craft, you’re now a member of the family. Still a family owned and operated company, Smoker Craft puts those values into every boat they build. Not that you would it, but Smoker Craft also has one of the best Warranties in the business with their Lifetime Plus 6. There is a limited lifetime warranty on all the hard elements like rivets, aluminum and plywood and 6 years on all the soft touch elements like vinyls, carpets, stereo and wiring. You work hard for your money so it’s nice to know your investment is protected. But once you get out for that first ride and fish you will know it was money well spent.